Thank you for your interest in CPR & AED training. 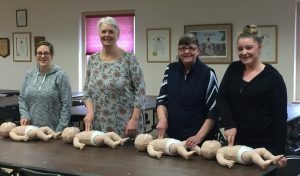 The upcoming CPR Heartsaver class on March 2nd, 2019 is full and no longer accepting registrations. Please provide your contact information in the Reminder Form and we will send you a reminder for the next CPR Heartsaver class. Please use this Girl Scouts Registration Form for the Girl Scout CPR & First-Aid class on March 30, 2019. 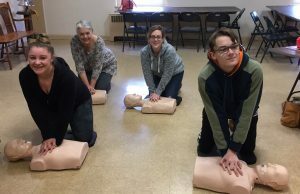 Please use this St Mary’s Registration Form for the St Mary’s Church CPR & First-Aid class on April 6, 2019. What is the AHA®, American Heart Association, Heartsaver® Course? The class size is limited to 10 persons. Please read the Heartsaver FAQsfor important information regarding the class. The fee includes the class, the student workbook, a CPR pocket mask for adults, and infants, a keychain CPR barrier device, pocket reminder cards, and a CPR eCard or a CPR & First-Aid eCard.